The day after we finished walking our pilgrimage, the rain that I was hoping would break the heatwave we had been having the past week, finally came. The streets were covered in rain puddles, and the temperature was twelve degrees cooler than on the last day of our pilgrimage. We started the day with a leisurely breakfast at our hotel where theq vast choice of healthy food was a delight. The Clement Hotel is located on the waterfront in Takamatsu, and from our bedroom, we could see the ferries that take people to nearby islands in the Seto Inland Sea. Years ago, the Benesse corporation created wonderful, innovative art museums and installations on some of these small fishing islands. They used prominent architects to design buildings, or to renovate older buildings into modern art sites. Fifteen years ago, we visited the island of Naoshima, and stayed overnight at its museum hotel. We were the only guests at the time, and we had the museum to ourselves. Years later, a handful of other museums and art spaces have opened on Naoshima, but we had only one extra day to see art, before we left for Ōsaka and our flight back to America. 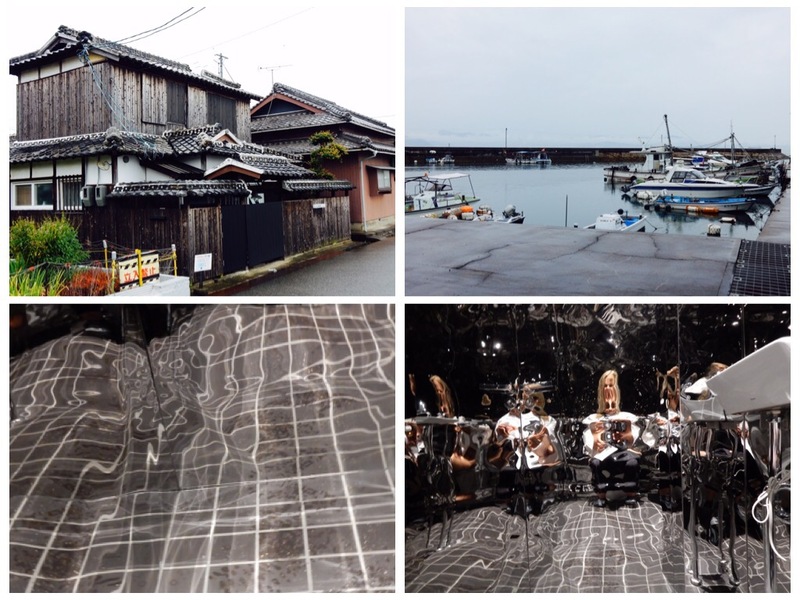 We took the late morning high speed ferry to an island called Teshima, which also has some very creative art spaces, set among its rice fields and small fishing villages. On the ferry, I sat next to a lady who spoke very good English, and she told me about all the places that we must see, the strawberry desserts we could eat at a farmer’s cafe, the few places to eat around the island and the exhibitions we could see. This name was given to the island because Teshima has a lot of natural spring water that allows the people living on the island to cultivate rice fields, and to grow olives and citrus trees. In addition, the sea has always offered an abundance of fish. Once we arrived at Teshima harbor, after about an hour’s ferry ride from Takamatsu, we took the local community bus to the Teshima Art Museum. It would have been only about an hour and a half walk, but we had no time to walk around the island and to make it to the last ferry on time. Plus, it was raining all day long. The Teshima museum is a stunning piece of modern architecture, integrating the landscape around it with the raindrop design of the building. The whole museum consists of three structures. The first one is just a small room built into the hill. It houses the museum’s ticket office and the toilets. After you buy your ticket and promise to take off your shoes and not to take photos inside the museum, you walk along an outdoor circular path to arrive at the museum. The museum is built of white concrete with no supporting beams, shaped like a teardrop or a raindrop. It feels like a very large concrete bubble, with circular openings to the sky that . allow both rain and light to pour in. There are invisible speakers in the ceiling emitting the sounds of birds singing. Drops of water ooze out of tiny holes in the floor and blend in with the raindrops coming from the rain outdoors. Because the floor is well waxed, the raindrops glide on the waxed floor which is also tilted. The raindrops form little rivulets that look and move like shimmering snakes. It has a spectacular effect. The third structure is the museum’s cafe and shop. It is also built from concrete in a circular shape with no supporting beams, but it is more rounded and not as curvy as the museum building. At the cafe, we had a lunch of olive rice and a strawberry soda. The rice was cooked with olives grown on the island, mixed with a small amount of pickled olive leaves. From there, we visited the Yokoo House Museum. Located in a restored old farm house, the museum is truly beautiful. The old wood and adobe farmhouse was restored with modern elements, like large panels of red colored glass, a glass floor above a Koi pond, and skylights. The stone garden has a pond that runs from the garden into the adjacent building. It was filled with gold fish. The old Warehouse and the Outhouse had wonderful contemporary art. My favorite art piece was inside its cylindrical tower. It featured hundreds of postcards of waterfalls from all over the world. Both the ceiling and the floor are mirrors, which gives the sense that you are standing in a never-ending tube, that stretches into infinity both above and below you. We did not get to try the desserts at the farmer’s strawberry cafe, because it was closed. Some of the small island galleries were also closed, in preparation for the upcoming Setouchi Art Triennale that will be taking place there and on the surrounding islands, starting July 18th. We did relax in two small cafes on the island and had some tea, coffee, lemon cake and a soy-milk pudding. It was a slow and fun day on the island, resting and enjoying some very good contemporary art. I have to admit that after the intensity of the past two months’ walking pilgrimage, the experience of looking at art paled in comparison. Art does not, and cannot, give you the same elevated experience that a spiritual pilgrimage gives you every single day. The next day we left to Osaka on the Shinkansen (bullet) train. In Osaka we stayed at the Courtyard by Marriott near the Shin Osaka station. In the USA, the Courtyard by Marriott chain of hotels is not really great, but in Shin Osaka, it is a fabulous luxury hotel with a good Italian restaurant, modern design and spacious rooms. But after being on the move every day, we realized that the feeling of comfort and luxury only amounts to a little more space to move around the room, a piece of art on a clean wall, or a big window that embraces the outdoors. It is all just an ILLUSION of comfort, and not anything real. We spent some time selecting a new travel camera and buying a few things that we had kept in mind, but did not buy when we had to walk every day, carrying all of our belongings on our backs. It was a long journey back to our home in the mountains of Colorado, taking a couple of days in all. We slept overnight in Denver and drove home the next day. There is always a lot to do once we return home. We have to sort through months of accumulated mail, do loads of laundry, clean the house, shop for groceries, update our computers, pack art, carry the outdoor furniture back outside, and much more. The first few nights I slept in our house I had lots of dreams. When I closed my eyes, I could still see the ancient temples, the big bells ringing, the pilgrims chanting the sutras and my movement through the countryside…..
One night I dreamt a version of the same dream six times. In the dream, a blind old woman came to me asking for healing and rejuvenation of her youth. She reached her arms toward me, saying that she had destroyed her physical body and that it was now beyond repair. In the dream, I told her that it is never too late to correct her mind, to embrace higher ways of thinking, to let go of her anger and instead to dwell on thoughts of LIFE and joy, of blessings and of eternal youth. I told her that health and youth could be restored in minutes, and that the body’s eyes are misleading. She could still learn to see with her heart, to see the core of goodness in herself and others, and to look beyond appearances. The dream repeated itself six times, each time with another person, an old man, or a very sick woman, coming to me asking for healing. The next morning I woke up puzzled. Who were those people and why did they come to me? Was the old woman someone I know, or a version of my future self? In the morning, I saw an email from my mother. She sent me a link to a video about instantaneous healing at a holistic medical center in Beijing, China. Three practitioners who were trained to FEEL in their hearts the essence of love and joy that permeates all life beyond illusions, chanted above a woman who had bladder cancer. This means that the chant was not a supplication to the universe to “please, please, heal this woman,” but a recognition that the Universe is all compassionate and all loving, and that life is eternal and everlasting. Death, sickness and decay, are illusions created by a collective human belief, and a mistaken body consciousness. They were not really created, just appear to happen. The affirmation of “Wa Sa – Already Done!” is a recognition that if we were to let go of our belief in death and give no power to the idea of sickness, they would lose their hold on us. Healing is instantaneous and has already been accomplished. It is our minds alone that need to catch up and to see that it is so. If it sounds too good to be true, it is only because our minds refuse to accept that life is eternal and everlasting. The appearance of sickness and death might occur, but you cannot really die. You simply take on another human form and reincarnate to start again, but with the same level of consciousness that you had before. You keep on going, creating a new life, full of new connections and new lessons. This is why working on ridding your mind of lower ideas and embracing higher consciousness, is never a waste of time. Your consciousness goes with you to create a new and better life the next time. On the other hand, if a person have the tendency to be discouraged, moody, cynical, harsh, disheartened and unloving, those states of mind will stay with them and will go on creating an unhappy life the next time as well. Ultimately, like the masters, it is possible to master the ability to rejuvenate your mind with higher truths so your physical form, which is nothing more than an outer manifestations of the ideas and beliefs you hold, vibrates at a higher, a finer rate…. At one with the Spirit of the Divine. The ultimate lesson is to know beyond all doubt that you are an eternal-life-being and one with ALL. The appearance of sickness is just an illusion. Once during our pilgrimage, I got sick. I woke up achy, feverish and with a sore throat, so infected that I could not speak a word. I did not give the sickness any power. I did not try to figure out how it happened, if it was due to the smoke in the tunnels we walked through, the water, the food I ate or exhaustion. I did not stay in bed and I did not “nurse” my aches. I kept on walking, kept on going, refusing to acknowledge the sickness which I knew my lower mind was manufacturing to keep its hold on me. And so within a short two days, the fever and the sore throat were completely gone.